David Mead from Future Proof Insurance argues that we should concentrate on client retention before lead generation. Imagine a world where customers pro-actively encourage their friends and family to think about the vitally important products which we are responsible for arranging? Imagine a world where people actually trust Insurance companies, believe that claims are paid (quickly), and where they are prepared to spend the equivalent of a cup of coffee a day on protecting themselves and their family? Whilst this is not a world we currently inhabit, it is a utopia which we should all surely aspire to? Let’s face it, we all have a lot of work to do to improve. The good news is, we have opportunities on a daily basis, and amazing technology at our finger tips to help us to engage with potential customers and then when they become clients, keep them engaged. 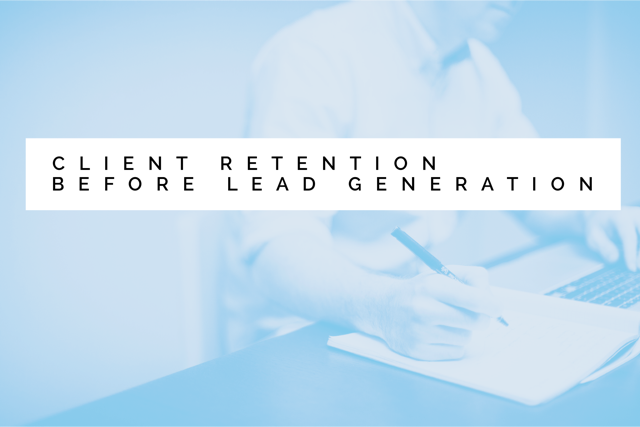 We believe investing in client retention before lead generation is the best long term strategy. Successful relationships are built by providing not only the best advice but also outstanding after-sales care. Investing in providing our teams with ongoing training in customer services is essential. At Future Proof we help all of our customer services team to achieve at least an NVQ level 3 in customer services, underpinning their ‘on-the-job’ practical training with a formal qualification. For many companies, your Customer Service Team is the first point of contact for customers, your shop window if you like. In many cases, a client’s first (and probably lasting) impression of our industry is formed during this initial contact. How many of you have had to call your telecoms provider in the last 12 months – enough said! It’s also fair to say that we also manage to shoot ourselves in the foot with the remuneration model which is widely adopted. A combination of thin margins, typically high marketing costs and up front commission doesn’t engender good practices. For the majority of clients, once business has been transacted, that’s it, they will never hear from the firm that sold them their policy or their insurer ever again. It’s on to the next client, with often little to no regard paid to existing clients. How many other industries would treat their customers (you know, the ones who are paying you money every month) with such disdain? At the outset we implemented a multi-media ongoing customer engagement strategy. All clients receive at least six contacts from us each and every year. Clients appear to value the on-going communication as on average over 50% of our emails are opened and less than 0.1% have unsubscribed. Trust and long-term relationships with customers are built by ensuring we always provide a consistently high level of service. The figures speak for themselves: in the last 12 months, we've seen a 70% increase in clients returning to arrange additional cover and a 43% year on year growth in sales from returning clients & referrals. We're also proud to have retained 93% of clients since we started trading. Looking to the future, we can see some exciting developments which should only continue to provide us all with opportunities to improve a client’s perception of our industry and to engage with them in an accessible and meaningful way. Although it’s already out there, underwritten multi-insurer quote comparison services are the next big thing. One way to improve our image is to stop providing a quote for one figure at the outset which can change when the offer is issued. Insurers offering advisers access to their Back-Office systems would be helpful. We should have the ability to log in and service client’s on-going requirements, such as a change of address and re-instating or amending direct debits. This would improve the client’s experience immeasurably and save everyone concerned a lot of time and money. Flexible remuneration schemes. Firms should be encouraged to form long term relationships and we as an industry should try to move away from upfront commissions. This would help to align all the parties’ interests. Electronic e-signatures would help more clients to arrange cover within a trust, speed up the application process, and you never know, might actually speed up the gathering of information from GP surgeries, heaven forbid! Omni-Channel communications. We have a lot to learn from the GI industry! We need to continue to work towards helping people communicate with us when they want, in the way they want, at the time they want. Email, Text, Social Media, Apps, Mobile, Live chat etc. Self-servicing will become more and more relevant. Offering a differentiated service for customers is essential. We offer self-service functionality on our website and have seen website business increase three-fold in the last 12 months. Annual statements. It seems to make sense to provide clients with ongoing information about the policies they own. Of course, this information needs to be accurate and up to date to reflect the current premium level and sum assured. Our aim is to keep customers at the heart of everything we do. But what does this really mean? We think it’s about constantly evolving to match the ever-changing way our customers want to be engaged. Future Proof is an award-winning firm providing Independent expert advice for all areas of Protection including Life Insurance, Income Protection and Critical Illness Cover. Founded in 2011, Future Proof has arranged over £550 million of cover for over 4,000 customers. Future Proof was named WINNER of the Best Customer Service Award at the 2016 Cover Excellence Awards.